The DHCP server has no install function and therefore also does not have an uninstall function either. 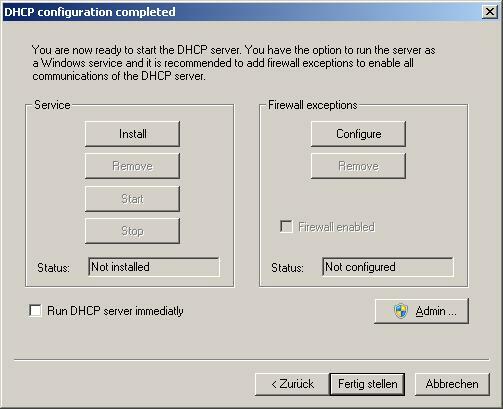 The DHCP server runs as an application without any install, just run it and stop it as you wish. If you are using the DHCP server as a service then you have to remove the service. To remove the service, you can either just hit the stop followed by the remove button or you go into the services applet of windows and remove the service there. Please keep in mind that you need administrator privileges to do so. Some people that have used the HTTP function of the DHCP server software, have experienced that the browser shows the DHCP status page even when the software is not running. This is due to the browser and its cache. Please just clean your browser cache in that case. After you have removed the service and cleaned the browser cache, the DHCP server software is completely removed from your system. This will consider all clients but 08:00:00:01:03:A1 to be a “validdevice”. 08:00:00:01:03:A1 is not. The term validdevice can be used to configure specifics in the scope section for the devices named by IPSCOPE_1. You can follow up on that by reading the IPSCOPE feature description. There is no need to go into details of that now for excluding certain devices from IP address assignment. Now also 08:00:00:01:03:A2 will not get an IP address anymore. Please be aware that this feature works only, if the client(s) don’t already have a client section in the INI file. Only new clients (unknown to the DHCP server) will be selected based on the IPSCOPE definition. Please note that only the four clients listed based on their mac addresses will be served by the DHCP server. The client section does not need to include anything. Simply add more client mac addresses to the list to serve them as well. The key to this approach is, besides the fact that you need to know the clients beforehand, is to set IgnoreUnkownClients=1. You can add clients to the INI file anytime. And, you can even use wildcards, as described here. This tells the DHCP server to configure only clients with mac address 00-40-8C-??-??-?? and do not respond to any requests from other kind of clients. Yes. It automatically uses all NIC’s that it finds and listens for incoming DHCP requests. Windows 2000 (and later OSs) has a little bit of a different behavior than previous Windows operating systems. It doesn’t tell you the IP address of an adapter until it is physically connected. The DHCP server since V1.3 supports that as well by implicitly stopping and starting itself whenever a change in the IP configuration occurs. You can also restrict the DHCP Server to certain cards by using the IPBIND_x entries in the [Settings] section or server “virtualization”. Yes. The DHCP server implements the DHCP protocol. And since V1.8 also the BOOTP style requests are supported. DHCP Server for Windows is not open source and therefore the source code is not available for free. No. The DHCP server reads the dhcpsrv.ini every time again, when a client requests an IP address. This happens every time you terminate the DHCP server. The reason is of technical nature and is by design. There is nothing to worry about, because it is intended behavior. The reason for it lies in the fact that the DHCP Server software uses blocking sockets as a communication resource. The DHCP Server basically is blocked in a socket call and waits for a request from a client. When you terminate the DHCP Server application, then the blocking socket function call is de-blocked by closing the socket. This then leads to the error message 10038. First, please check that the HTTP Server is enabled. If the HTTP Server is not enabled, then the “Open Status” entry in the context menu is grayed. The status info is provided as a web page and therefore requires the HTTP Server to be enabled. Now, the url to access the status web page is http://127.0.0.1:50555. The IPPOOL_x setting allows to configure an IP pool like 192.10.1.2-254. This is a class C network with a subnet mask of 255.255.255.0. To define a class B network simply configure the IP pool such as 192.10.2.1-192.10.5.254 with a subnet mask 255.255.0.0. Thats all. DHCP server versions prior to V2.3.1 require a bit more effort. Yes. Set UseClientID=1 and all client sections will be named after the option 61 supplied name of the client. See UseClientID setting for details.